Due to popularity we are ticketing entrance to the maze each day. Tickets are free, please book your spaces via eventbrite. Please be aware you will have 15 minutes in the exhibition and will be asked to remove shoes. Welcome to WALALAxPLAY, an art installation that explores bold colours, patterns and reflective surfaces. The design concept is vivid and playful but the maze is not a soft play area. Babies, toddlers and children must be accompanied and supervised at all times. Food and drink are strictly not permitted in the space. The maze can be viewed from our mezzanine level at the discretion of staff and may be restricted in busy periods. NOW Gallery, Greenwich Peninsula’s cultural platform for exciting design, fashion and art exhibitors, is delighted to welcome renowned digital print designer Camille Walala as its 2017 Design Collaborator. From 14th July – 24th September, WALALA x PLAY, an interactive abstract installation and immersive maze will capture the imaginations of NOW Gallery’s audience this summer. WALALA X PLAY welcomes visitors to explore, examine and enjoy a labyrinthine network of corridors and enclosed spaces in a ‘temple of wonder’ created by Walala Studio. A key part of this installation will be an imaginative puzzle which invites the solver to identify the inconsistencies between two otherwise identical images. WALALA x PLAY brings this concept off the page and into three- dimensional space, inviting visitors to linger and explore colour, shape and scale, contemplating formidable pattern to find the differences. The anomalies and asymmetries will generally be discreetly positioned, requiring visitors to scrutinize the space from all angles to complete the puzzle. Secret spots will be found when looking down from the balcony or looking up at the suspended elements. This element of physicality will encourage individuals to become more aware of their bodies, engage their minds and give themselves over to PLAY. Visitors are encouraged to pass through the gallery and experience a range of spaces, some open, some tight and uncomfortable, some with dead ends. With walls of different heights, passageways of different widths, curved and zigzag paths, the installation addresses the idea of human scale. It ensures that visitors leave with not only a visual impression of the installation, but transformed by the experience of their own passage through it. Mirrored panels reflect the space back on itself; suspended shapes introduce a feeling of lightness and playful disorientation – the installation is a journey that will challenge, reward and engage the visitor in equal measure. The waterways of the Greenwich Peninsula, the curve of the Thames, and the internal shapes and angles of the Marks Barfield buildings are referenced and represented in the ideas of flow and reflection that define WALALA x PLAY. The layout of the installation playfully mirrors the shape of the building. The gallery sets the template for the flow of the space. For this summer installation NOW Gallery is pleased to have Camille Walala’s positive vibe, expressed through vibrant colour and bold pattern. Her work harnesses optimistic typography and exuberant geometries to create environments that stimulate the senses and inspire joy. A graduate in textile design from the University of Brighton, she established her namesake brand in East London in 2009, and continues to live and work there today. “We love having colour in our gallery space, it glows through the glass and resonates on Peninsula Square. Camille Walala is the queen of colour and her patterns will create another world for all in NOW Gallery. We are creating a playful place where – as is in our past exhibitions – we give people time to linger, digest and unpick puzzles giving space to let the installation resonate” says Jemima Burrill curator of NOW Gallery. Showcasing one-off experimental and exciting art and design, NOW Gallery on Greenwich Peninsula provides artists and designers with a place for investigation, and space to develop ideas to create an unprecedented artwork they would not usually have the opportunity to develop. WALALA X PLAY, will be available for visitors to view for free from 14th July – 24th September. 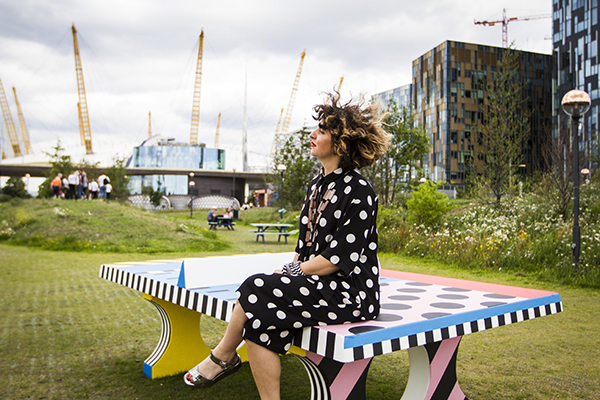 NOW Gallery has also commissioned Camille Walala to create two unique ping pong tables in Peninsula Garden. 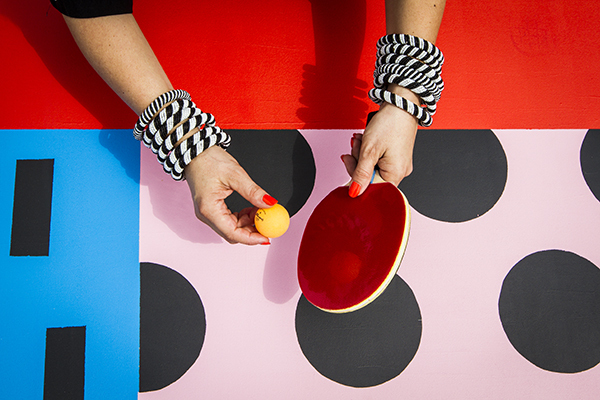 Get a bat and ball from NOW Gallery reception and play a WALALA game of ping pong.